Hellboy II: The Golden Army will be available on Blu-ray Nov. 11. The film from director Guillermo Del Toro and Universal Studios Home Entertainment will be formatted in Widescreen 1.85:1 and DTS-HD Master Audio 7.1 sound. With the Blu-ray Disc, Hellboy fans can create their own downloadable comic book using scenes from the movie and chat with friends via BD Live. The film will also be available on standard definition DVD in widescreen or fullscreen mode, and also in a 3-disc widescreen special edition with special packaging. The Hollywood Reporter calls this film “one hell of a wild ride.” It stars Ron Perlman (The Mutant Chronicles), Selma Blair (Legally Blonde), Doug Jones (Fantastic 4: Rise of the Silver Surfer) and Jeffrey Tambor (“Arrested Development”.) This is the second film based on the comic book and characters created by artist Mike Mignola and Dark Horse Comics. All versions of the discs include commentaries with director Guillermo del Toro and cast members, Set Visits, Troll Market Tour, Animated Zinco Epilogue Comic and deleted scenes with optional director commentary. The 3-disc set and Blu-ray disc include Pre-Production Vault, “Hellboy: In Service Of The Demon” a documentary about the creation of the film, Production Workshop, Image Gallery, and DVD Rom: Hellboy II: The Golden Army Script. The Blu-ray release will feature My Chat, Comic Book Builder, and U-Control. 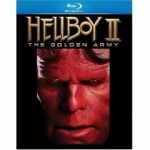 The standard DVD release of Hellboy II: The Golden Army in full screen or widescreen will retail for $29.98. The widescreen 3-disc special edition DVD will retail for $34.98. The 2-disc Blu-ray high-definition version will retail for $39.98 SRP.